"Life is brief. 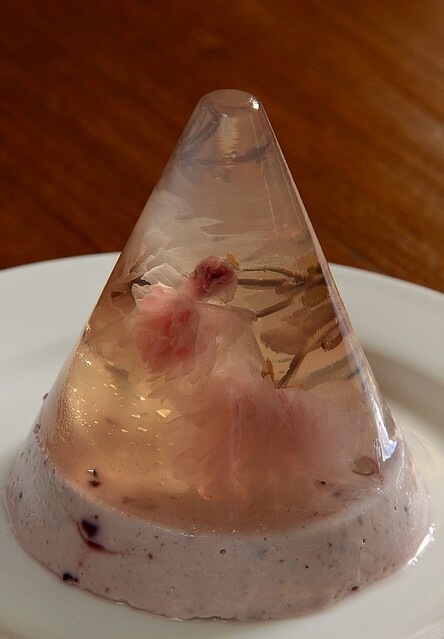 Don't forget to stop and smell the sakura"
Almost like a painting: Sakura flowers set in a clear jelly (made with the pink soaking liquid of the sakura) with a base of dark cherry mousse and cherries. I couldn't get a good photo of the jelly and the flowers turned out blurry because it was a rainy evening, around 5:30 pm. The background was the reflection of the sunset on my table. I very nearly didn't want to post anything, thinking that I should skip a post and make this jelly again. Am glad I just went with it. The jelly above was made of gelatine while that in the first picture was made of konyakku. Gelatine sets slowly and is less viscous even when it's not hot so the sakura unfurled fully while konyakku becomes thick very quickly and the flower can't fully unfurl. The Sakura Jelly I'm posting today for the Royal Selangor Pewter Jelliriffic! challenge towards breast cancer awareness and aid for the Breast Cancer Welfare Association was one of the first jellies I made before the challenge. I came across the most beautiful Swiss roll here and wanted to get hold of sakura no shio zuke, pickled sakura flowers, online but received a reply from rakuten.com that they don't ship overseas anymore. Again, Yo was my friend indeed because she arranged for her Japanese colleague Sumiko to get me the flowers from Osaka a week after my SOS; how great is that. Thanks, Yo and Sumiko! Every spring, the Japanese practice the custom of hanami, picnicking under the blooming sakura trees, to appreciate the beautiful but ephemeral blooms which symbolize the beauty and briefness of life. Pickled with plum vinegar and salt, sakura no shio zuke flowers are used to make snacks such as mochi, jellies and buns. Sakurayu is pickled sakura tea, drunk during weddings because sakura, being a spring flower, represents a new beginning. How do the flowers taste? 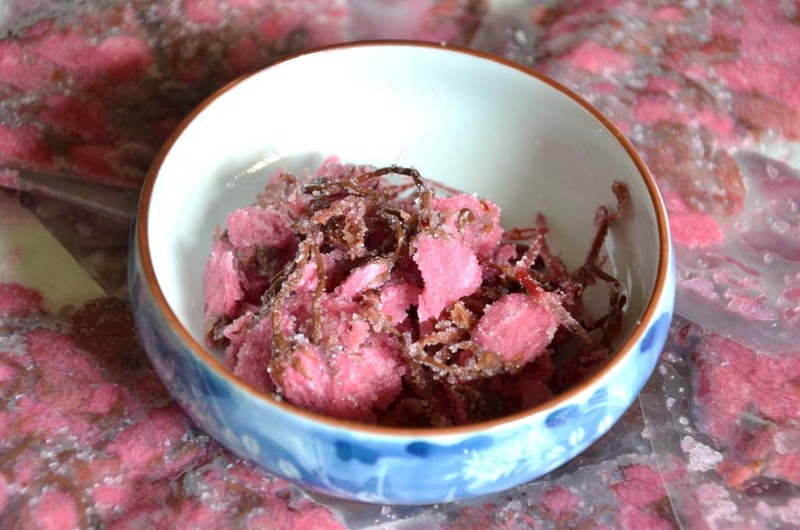 If you love salted dried plums (huamei in Chinese), you'll love the flavor of sakura no shio zuke but if you've not eaten umeboshi (pickled plums) or the Chinese suanmei or huamei, you might find the flavor kind of unusual, especially in a jelly. The pickled flowers are extremely salty. I've had flowers that tasted salty even after being soaked for a week! 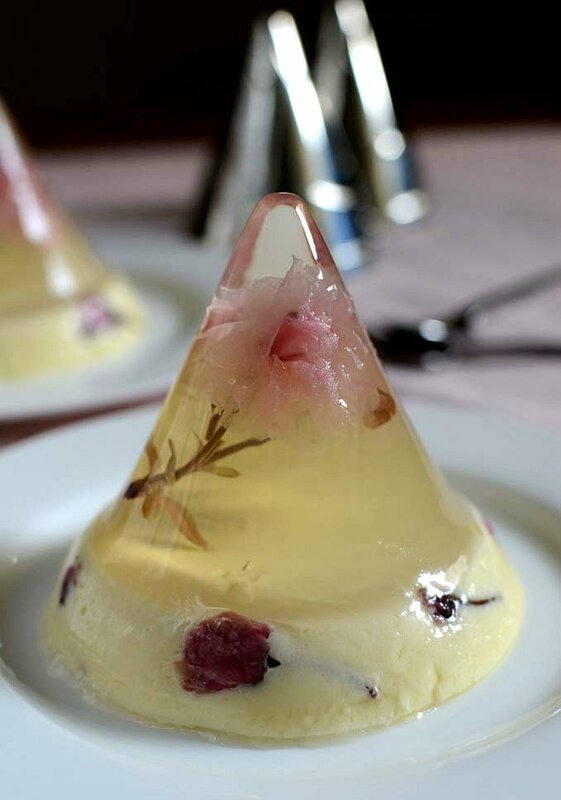 I first made the sakura jellies weeks ago with a white chocolate mousse base and loved the result: clear jelly on top and sweet white chocolate mousse at the bottom. 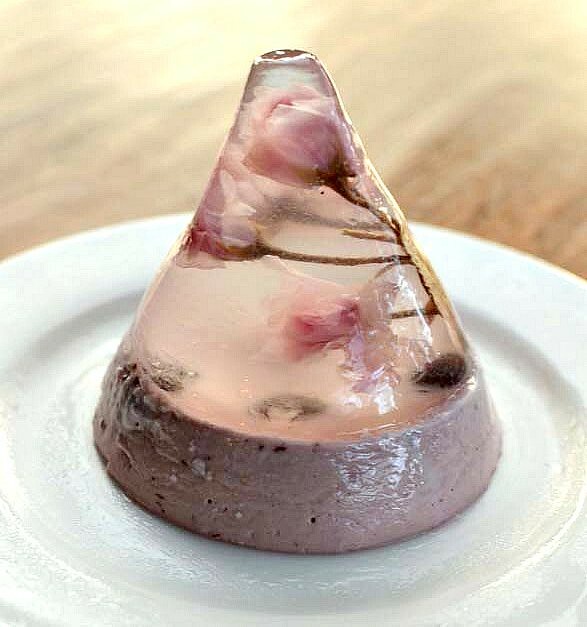 This afternoon, I made a sakura jelly with dark cherry mousse at the base. I kept the top clear layer salty-sweet by using some of the water from soaking the flowers--it's drinkable so why throw it away--and I made the mousse quite sweet to balance the saltiness of the top layer. I really love this jelly for all its beauty and complexity of flavors. I think I may be sakura no shio zuke crazy. I know what you are saying, that I can get the same flavor from huamei or xenmei but salted plums aren't pretty at all. The sakura is and thanks to the inventiveness of the Japanese, the flavor and beauty of the sakura can still be appreciated long after their brief season has gone. 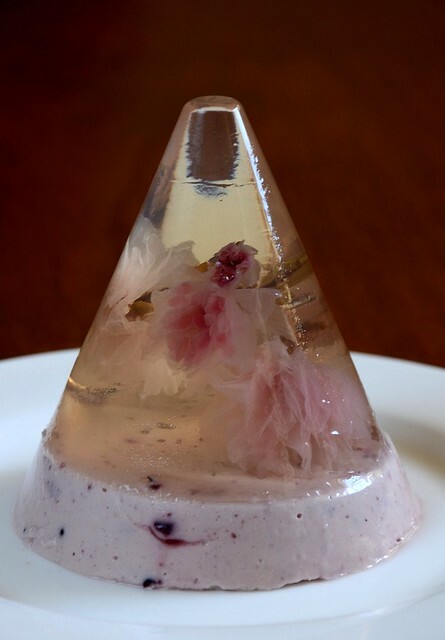 A single sakura blossoms in clear jelly on a base of white chocolate mousse. --Rinse and soak in warm water for 3 to 4 hours. Rinse and soak again for 1 hour. Keep the water. 1) Mix the konyakku powder, citric acid and sugar together well. 2) Put the water into a small pot and sprinkle the konyakku mixture over the water, stirring well. Heat undeer low flame until all the sugar is dissolved and the water becomes clear instead of cloudy. 3) Rinse and place a Nick Munro mould into a mug. Pour half the konyakku jelly into the mould, drop the flowers in (use a wooden skewer to hang them). Use a toothpick to push the sakura gently to and fro so that the petals unfurl. Wait until the jelly is half-set before pouring the remaining jelly in. You will have to re-heat the remaining jelly because it can gel quickly. Cool and work on the nest layer. 1) Mix the gelatine powder with the sugar and sprinkle over the cherry liquid in a small pot. Heat and stir to dissolve the sugar and gelatine. When cool, chill it until it's nearly syrupy. 2) Arrange the cherries on the clear layer. 3) Whip the cream until stiff, then whisk in the cherry liquid and pour the mousse over the clear layer. Cover and chill for at least 3 hours. 1) Mix the gelatine powder with the sugar and sprinkle over the water in a small pot. Heat and stir to dissolve the sugar and gelatine. When cool, mix the melted choc in. Chill slightly. 2) Whip the cream until stiff, then whisk in the choc-gelatine mixture and pour the mousse over the clear layer. Cover and chill for at least 3 hours. My dear, I dont know how you do it but you are so creative. I love this. I think this is so pretty! Very nice piece of art! Where to get the salted sakura? A Beautiful Breathtaking Dessert! Keep up the Excellent edible creativity! I enjoy eating flowers with salads and used to garnish cakes with them too..
Yolanda introduced me to your blog and I'm so glad she did! This is so so so pretty! I can imagine hearing my girlfriends squealing if I were to make them for a girls night out party :) I had seen that beautiful swiss roll and had been thinking about where to get hold of those pretty flowers. This is a beautiful creation Terri and a wonderful dedication to breast cancer. 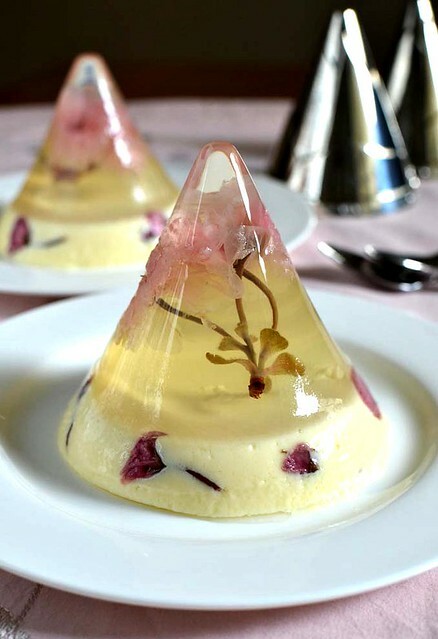 I like the clarity of the sakura inside the jelly and your variation of the base flavour. Great artistry! O dear..I cant take my eyes from it..so lovely..beautiful!!!! i really do love how the sakuras bloom in water - lovely! how i wish i could get my hands on them too! Now how about something for the men? That jelly is breath taking. Sakura flowers are amazing to look at, I didn't know they were edible. I've learned something new today! Lovely!! I have been trying to get my hands on this Sakura flower thingy and like you said, they dont export it out anymore. Lucky you! Hehehe.. I must say that this is very unique and you have once again enticed me to try to make this.. but I must first get my hands on the sakura flower.. hehehee.. This is sooo beautiful. 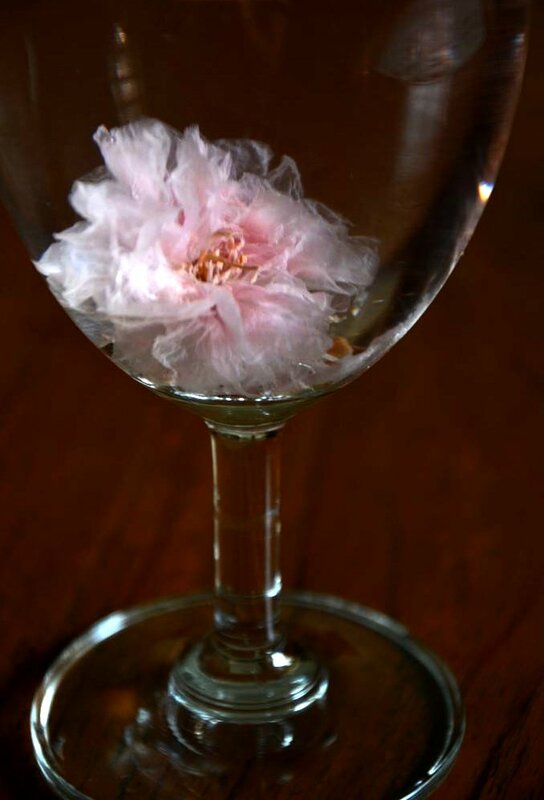 The lovely sakura flower suspended in clear jelly is just like art. Your creations are so elegant, seriously! Well done ... you win the Day 12 challenge hands down!! Superb ... an edible work of art. You've nailed it with this!!!! Elegant and a piece of art! It took my breath away.You nailed it Terri. This is SO unique and beautiful. I love it. It's like a piece of Art, you are very creative. You are sooooooo talented and creative !!! Beautiful works of art ! This is so unbelievably beautiful! It should be THE SYMBOLIC JELLY for the whole challenge! i have no chance to taste your Sakura Jelly but can just admire your beautiful creation! You r an absolute genius! This is sooo beautiful I want to sigh! Oh my, this has got to be the prettiest jelly you've created. It's truly a work of art. Another gorgeous creation Terri. The photo is stunning. Makes me wonder how you were able to make the flower bloom so well in the jelly. This is a work of art. You're absolutely amazing, coming up with these incredible ideas. I looked at the pictures for the second time today bcos they are so beautiful. Sure going to look at them again tomorrow. You are so good with your creation and knowledge. Looking forward to enjoy your creation. Oh my, this is really impressive! those sakuras are well matched with the colours of the jelly..
Got caught up with things for a couple of days. Looked into your blog today and saw the the single stalk sakura. Looks really exquisite! I'm amazed that you can get your hands on all sorts of ingrediants. You are really resourceful!!!! MUM......I STILL WANT YOUR ATTENTION EVEN IF YOU BECOME SUPER FAMOUS OKAY. Exquisite! Magnifique! I'm awe-struck! Love your stories and phrases too. I was just thinking about the colours of Borneo like Bajau horsemen, the multi coloured traditional costumes and hats of Sabah. Maybe can do a jelly along those lines? What about Tanjung Aru Beach as an inspiration for another jelly?- beach, softest sand in the world, sun set, etc. Maybe even a spiritual one - good and evil, a black and white clean cut sophisticated jelly. The sky's the limit for you Terri. Thanks for sharing your creativity with us and making the world such a pretty and happy place just to log on and see your jellies!! sometimes i just wish that maybe my mum could be creative like you are. you should be one of the judges in Masterchef Australia you would be a good one . My goodness. These are works of art! They are so exquisite and the photography is doing them every bit of the justice they deserve! Just wonderful... i never think that it was so easy to immortalize something, thanks to you i have a new project this month, thanks a lot. Stumbled upon your blog while searching for Sakura flower recipes. Your Sakura Jelly is really breathtaking. I am having someone bring back some flowers and essence from Japan and I cannot wait to try your recipe. I notice the water for the jelly part is only 150ml. Isn't that very little? I don't now how big your finished product is but I am wondering with your recipe, how many pieces of the conical jellies did you make. Thanks. Thanks for sharing this wonderful recipe. I liked it so much that I added it to the list of best sakura recipe with a link back to your blog. This is the most amazing AND ambitious dessert I have ever seen. Thank you for sharing! Your recipe looks amazing! I was wondering where do you buy the molds? has anyone actually made this dessert? Well, this flower show piece looks so impressive and can be used as Send gifts and flowers in philippines from anywhere, I like the pics you have upload in the post. How many molds will this recipe fill? We are having a dinner party with 16 people. Just wondering how much I need to increase the recipe by. Thank you...It looks AH-mazing!! Hey. What other flowers can you use instead of Sakura as it is not available.